It is a department called IVT and is for R&D which develops a part together with customers so that we can add as much value as possible to the part. IVT proposes VE/VA solution for a part from its development phase and supports the part from prototype until series production step. In order to provide a part more efficiently, we analyze its mechanism, structure and press forming process. 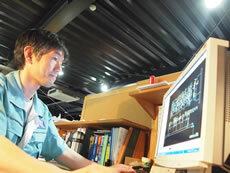 This results in the reduction of errors in prototype and series production and give customers the maximum value. Get information from a customer such as functional requirement and cost. Make proposal drawing based on the discussion with a customer and provide VE proposal and quotation. By receiving order for prototyping from a customer, we do trials with prototype tooling. Tooling for series production will be made after a part passes functional check and SYVEC receives customers approval. SYVEC do trial with tooling for mass production, and provide certified parts after measuring the product. 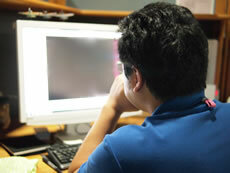 With a customer’s approval, series production starts. Due to its mechanism, reduction gears needs tens of time’s input rotation in order to get one rotation in output shaft. Thus, it takes long to analyze 1 cycle-movement. 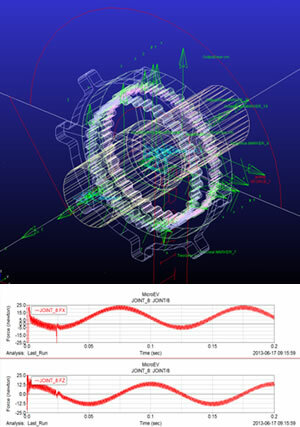 Moreover, the shape of gears must be input accurately for analysis of cycloid gears, so it is very difficult to do contact stress analysis such as nonlinear analysis if we set all components as deformable body. Therefore, we calculate reduction efficiency and whirling force due to its eccentric movement by using mechanism analysis. In addition, we figure out the moment when the components have to bear the largest burden during a cycle by mechanism analysis, then, we output the modeling data to structure analysis so that we can analyze its strength. Cycloid reduction gears have a feature that gears move eccentrically in order to have high-reduction ratio. The eccentric movement causes vibration of the whole unit directly. In addition, the eccentric movement give stress to other components, so the weight of geared area must be light as much as possible. 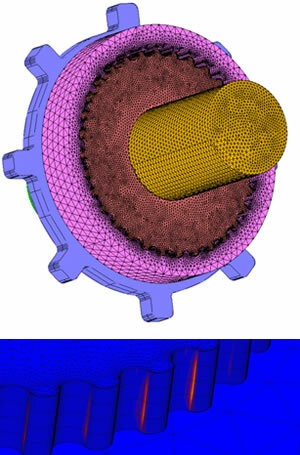 SYVEC is able to design gears as thin as possible by analyzing the strength of the part through structure analysis. We can see the possibility of forming and decide which facility to use in ahead by estimating forming load through forging simulation. We can also estimate the forming shape, so we can set the best processes design and propose forming shape to a customer. Furthermore, we can figure out the best blank size by the analysis and minimize the material use. By regarding tooling as deformable body and analyze it, we can estimate how much load will be applied to which part. This enables us to consider the possibility of the process before actually try it.